ChargeIt by Jay Purple Ruffle Rim Charger Plate 13"
Home > Products > ChargeIt by Jay Purple Ruffle Rim Charger Plate 13"
A stunning addition to banquets, anniversaries, or holiday dinners, the ChargeIt by Jay Purple Ruffle Rim Charger Plate 13" is perfect for setting a bold yet sophisticated table. 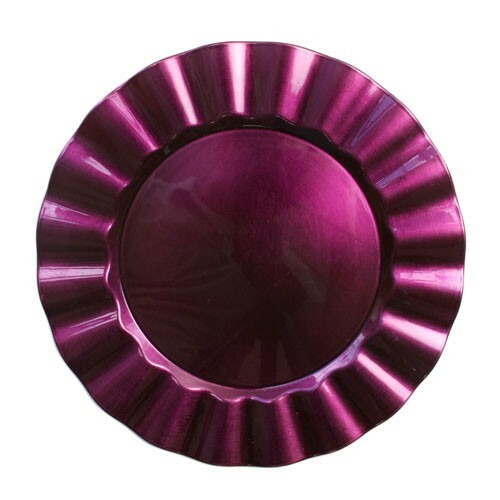 Featuring a rich purple finish, this product adds a chic and contemporary flair. Thanks to its charming ruffled rim, it beautifully frames your entree, enhancing your table decor. Made from high quality polypropylene, this break-resistant charger is exceptionally durable and long-lasting. Decorative, spacious, and economically-priced, this charger plate is a practical yet elegant accessory for a variety of upscale events.